We’ve already determined that 23andMe’s raw data offers the most health information among consumer genomic tests. We’ve fixed problems with the SNP data, and reverse-engineered 23andMe’s proprietary insertions and deletions — allowing us to make the most accurate and comprehensive interpretation. Now lets jump in and take a look at the health information that is available from 23andMe and from the raw data. 23andMe was launched with the promise of bringing personal genome information to consumers everywhere. For several years, they were able to provide information on both health-related traits and ancestry. Then, in 2013 the FDA stepped in to stop the delivery of results on health-related traits. Starting last month, 23andMe has revamped their service, and will now be able to offer some health reports, but not as many as before. As we developed and tested Enlis Genome Personal – it became clear that the raw data from 23andMe contains significantly more health information than they are reporting in their health reports. That got us interested to put some numbers on just how much information there was in the raw data. 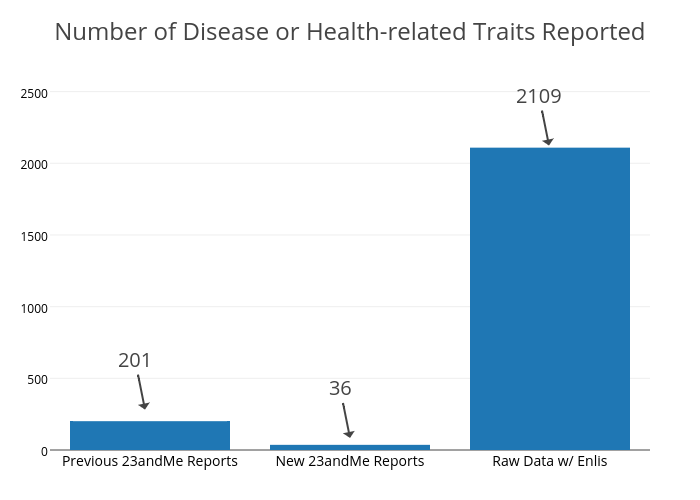 First, we wanted to compare the count of diseases or health-related traits that are reported by 23andme vs. how many are found in the raw data. Edit: This is surprising because the Illumina Infinium technology (the genotyping chip that 23andMe uses) tends to have low error rates and 23andMe has real world data on over 1 million customers now. The FDA document about 23andMe’s approved Bloom Syndrome carrier test says that “all homozygous variant genotype samples receive a ‘no-call’ result, since the calling software was designed not to detect homozygous variant genotypes.” It sounds to me like they designed the software to ignore and throw out homozygous data. A disease or trait can be caused by different genomic variants, and each of these variants can be tested by 23andMe. For instance, 23andMe reports on 28 different variants that are connected with Cystic Fibrosis. So how many total health-related variants are reported by 23andMe? And how many are in 23andMe’s raw data? 23andme has a long way to go to get back to reporting the same number of variants they were before the FDA ban. However – both the previous and new 23andMe reports pale in comparison to an analysis of the raw data. 23andMe’s new reports tell you about less than 1% of the health-related variants that are in their raw data. 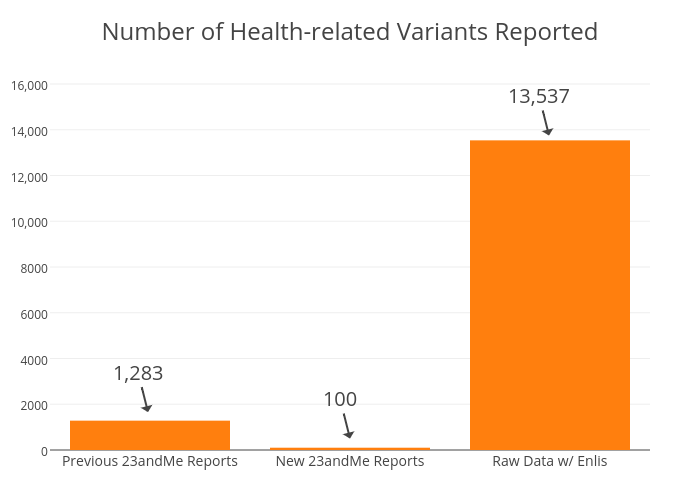 This is only a small sample of diseases and conditions, but you can see the enormous disparity between the number of variants reported by 23andMe and the number that is in the raw data.